Greg had a great day at baseball, winning the coveted game ball. Afterwards we went to Toy R Us so that he could use his money to buy some Gogo Crazy Bones. While there, Miss Sally asked us to get a Slip-n-Slide. I knew this was a good buy because the kids on the front of the box were having an awesome time. At home in the backyard, something was amiss. 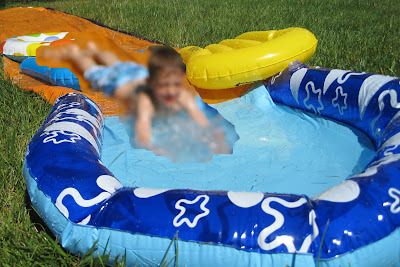 I unfolded the slide and immediatley found that the end with the water collection splash enabler was much smaller than expected. The box showed a kid sliding into a small baby pool sized basin. This was much smaller. Here is the slide in action with the box for reference. This was take number 122 to get the photo just right. You can see the Greg's hand reaches all the way to the back when his shoulders are at the edge of the pool area. A total misrepresentation. That's something I would expect when paying $4.99 but NOT $6.99! I wanted to see if it was possible to get the shot on the box, so I got down very low and got the box angle. Out of Focus Virtual Greg looks like he is having an awesome time. Oh my gosh, this made me laugh out loud! Those crazy Asians and their knock-off toys. Poor, giant Greg. ahahahaha! Great post! Terrible pool! As you've noticed, angle is everything when it comes to photography. The camera is not the eye. I had to get a picture of a tree for a recent magazine article - not just any tree, but a specific species. The only one I knew the whereabouts of, was a sapling not more than 5 ft tall. Lying on the ground and photographing upwards, I made it look higher than the roof. Never trust photographs. In your effort to capture the right image, it would appear that you have received your money's worth already.